Brisbane parfait fans disenfranchised by the closure of Queensland’s Big Pineapple may want to make a beeline for Tropical Fruit World on their next journey south. There haven’t been many places serving pineapple, whipped cream and wafer sundaes since the end of the 1970s, so stop by and dig in if you swing that way (I don’t – not that there is anything wrong with that). Of course, there’s also the disarming idea of basing an entire theme park on the delights of tropical fruit. I had previously made two aborted visits to this place for various reasons, but this year I finally got to experience Tropical Fruit World in its full majesty – and oh, what majesty! I don’t know whether it was Stockholm Syndrome, but I really enjoyed the experience. On the count-back though, it was $44 for a tractor ride around a farm, a bit of strange fruit and a chance to feed the ducks, two evil-looking emus and Sherman the horse. But then again I also got a bucket of avocados for $8, which at today’s supermarket prices probably covered most of my admission. 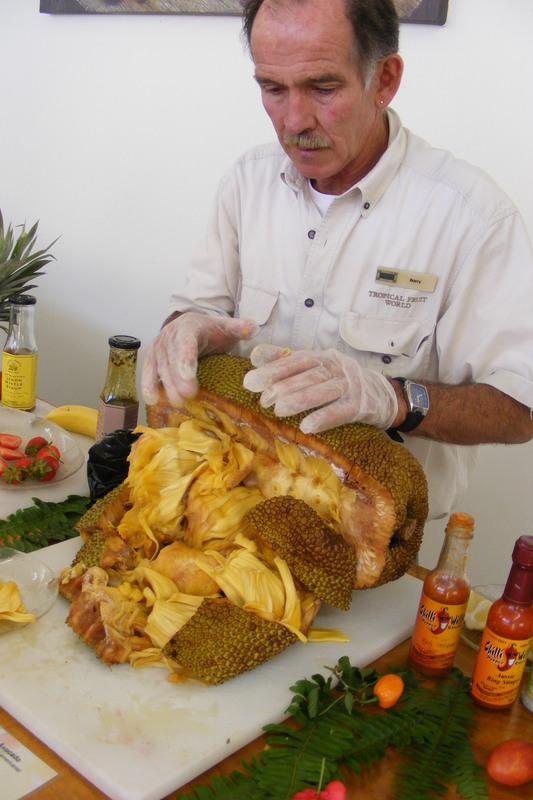 And it’s not every day you get to tuck into a red banana, some soursop or a sapodilla. Heck yes! A pop quiz of a few different groups of friends about Tropical Fruit World seemed to draw nothing but blank stares. If prompted (and believe me, I did), they may or may not have a vague recollection of a big avocado out on the Pacific Highway. But Tropical Fruit World is chasing the lucrative international tourist dollar, and they’re not doing too bad for themselves. 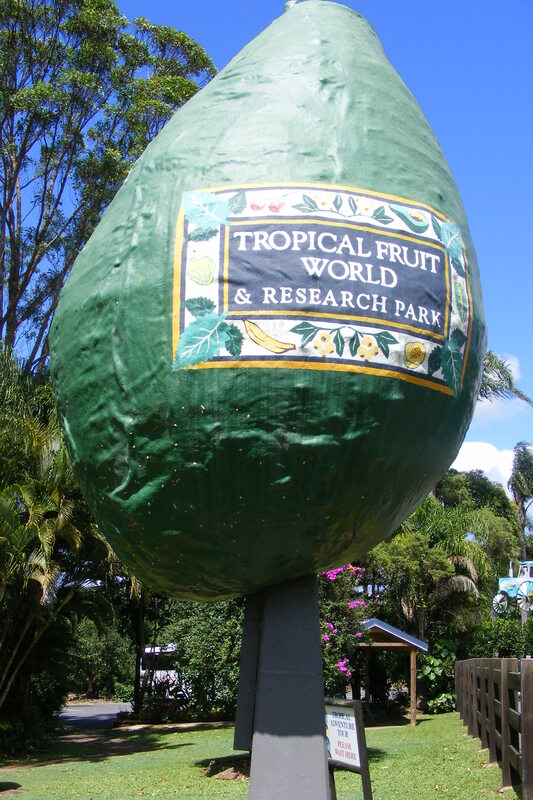 According to Barry, our Tropical Fruit Host (pictured left), the park attracts around 80,000 visitors a year – a total of 6 million over the last 30 years. A bit of quick maths suggests that his guestimation was about 3.6 million visitors out, but it’s still a fairly healthy number. And although the only other people on my tour were a honeymooning couple from Bundaberg who were doing their best to ignore me, the tour groups before and after mine were packed tighter than a bargain bin of hams in the post-Christmas sales. If you’ve got kids, the flying fox, miniature railway and mini-golf at Treasure Island should keep the little ones entertained for a while. If only there was a bar serving tropical fruit daquiris, there really would be no reason to delay. My visit was around 2.5 hours, making it a great way to kill some time if you’ve got too much of that on your hands. If you do the tractor ride there’s not really any way to cut that timeframe short, and it ultimately forced me to abandon my plan to visit the Crystal Castle on the same day – a new age theme park deep in the heart of the New South Wales hippy belt. 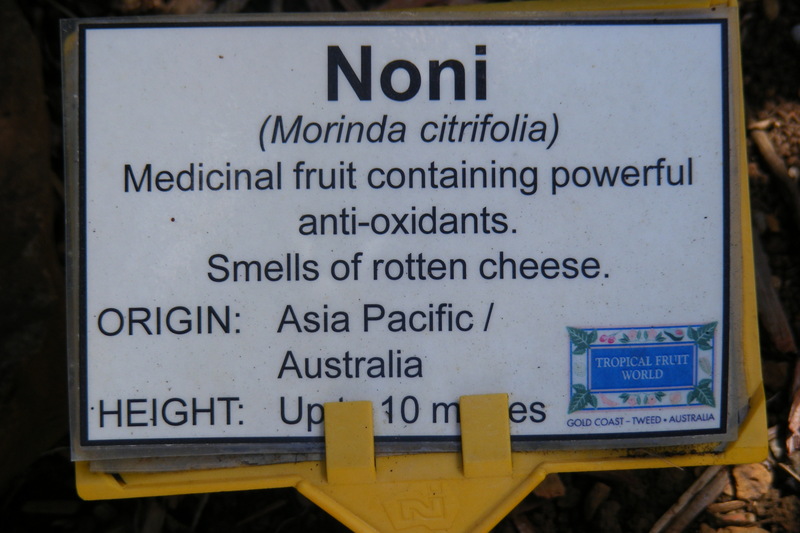 But there was still enough of a an otherworldly strangeness to make Tropical Fruit World worth visiting if you’re in the area.